Our group all arrived today in good order in Berlin for the start of our Germany tour. We are going to follow the footsteps of Martin Luther and the Protestant Deformation. I know that it’s called the Protestant “Reformation” but as a convert to the Catholic Church I realize now that it was not a reformation but a revolt which ended in a deformation of one, holy, Catholic and apostolic Church. Jesus prayed that we would all be perfected in unity (St. John 17) that the world might know that the Father sent the Son. This unity had to be VISIBLE or the world would not be able to see it. Martin Luther instigated and was the cause of a major schism that smashed the unity of the Church. Mahatma Gandhi he said that if all Christians were united India would fall at the feet of Jesus Christ in 24 hours. We are here in Germany to study this schism in the church, what brought it about, what we should think about it and what we can do about it. Below is our first day video of our arrival and here is the first excellent family that was given by Fr. Steve Thomlison who himself is a convert from Lutheranism. Germany Berlin All Day! Berlin Wall, Wow! After celebrating mass at the church of Saint Thomas Aquinas (brilliant homily here) we spent the rest of the day touring Berlin. There’s a tremendous amount of history here and we packed a lot in. I think the most moving part of the day was as we walked around the remaining segments of the Berlin Wall and saw all the pictures and images of what it was like here not too long ago. 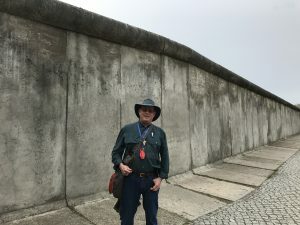 Janet and I shared with the group our experience here in 1985 when we smuggled Bibles, books, medicine and money into the Christians behind the Iron Curtain by driving through checkpoint Charlie. The first video details our tour of the city and the second shorter video is of our fun evening on the dinner cruise on the Spree River running through Berlin. Today we went to Castle Church in Wittenberg Germany. I had promised people I would deliver their “95 Reasons for being Catholic.” We ended up with many hundreds of reasons that were sent to me. I kept my promise today and delivered them to Martin Luther in person. Here is a short two minute video. Leaving Berlin we drove to Potsdam to tour the palace and gardens of King Frederick the Great though we concluded that in the culture wars he was more our adversary than a friend. Wittenburg was an amazing though sad visit since this is where Martin Luther nailed the 95 Theses to the Wittenburg Door which started the Protestant Devolution. Join us as we tour the city, see his Tomb, leave him 500 Reasons to Be Catholic and celebrate Mass in the only Catholic Church there. You can watch another excellent homily here. Tour of historic Leipzig where The 20 day debate between Luther and Eck took place – a debate st which Luther fared poorly. It was here also that Johann Sebastian Bach did most of his creative work. Started the day with a reverent Mass and great homily well worth your time (Part 1 and Part 2) and Steve’s impassioned talk on the reason and need for ONE UNIFIED CHURCH (included in video below). Excellent local guides took us on an intimate tour of their city. Afternoon was free and we had an exquisite dinner in the most popular and historic restaurant in Leipzig. Eisleben: birth and baptism of Luther. Also where he preach his last sermons and died. This was also the town of St. Gertrude the Great. We has Mass at St. Gertrude’s with another fantastic homily. Mansfeld: Luther’s childhood home and church where he sang in the choir and served as an altar boy. He was beaten by his mother and never excepted are loved by his father. His father was angry and rejected him for going to the monastery. It seems that his relationship with his father seriously skewed his view of acceptance and love from God. He was beaten by his mother and never excepted are loved by his father. His father was angry and rejected him for going to the monastery. It seems that his relationship with his father seriously skewed his view of acceptance and love from God. Erfurt: The Augustinian Monastery where he lived from 1505-1511 and where he was ordained and received his doctorate. Our Radisson Blu Hotel is also in Erfurt. Along the way Ken Hensley, Fr. Steve and I gave Seminars on Luther, his early life, indulgences, purgatory and salvation. We started the day in Eisenach Germany with Mass at the Church of St. Elizabeth. She was an amazing woman well before the time of Luther who cared for the poor in an exceptional and miraculous way. 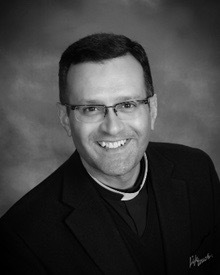 You can hear the excellent homily here (Part 1 and Part 2). Lastly we visited the Wartburg castle of other mountain were Saint Elizabeth had lived until her husband died. It is also the place were Martin Luther head while he was under a death sentence and where he translated the Bible. However, Protestants assume he was the first to translate the Bible into the common language but that had already been done by the Catholic Church with 14 additions of the Bible in German. Today we visited Marburg which is a quaint and historic town with the beautiful Bavarian looking houses and buildings. No one wanted to leave. Up on the mountain was the castle of Marburg where Luther, Melanchthon, Zwingli and a large group Protestants gathered to try and hammer out the “Protestant theology.” I explain more in the video. Then to Boppard for Mass (homily) and a birthday party. Today we visited the city of Worms Germany where Martin Luther was called before the “Diet” or Tribunal of the Holy Roman Empire at the “Diet of Worms” in 1521. I know that sounds funny and kind of disgusting but a “diet” was a tribunal and it was held in the city of Worms in Germany. We celebrated Mass there at the Church of Our Lady (Homily Part 1 and last 2 1/2 minutes of homily here). We visited that site today and learned more about Luther from Ken and other conversion stories and had fun along the way. Klara our guide told us her story of growing up atheist in Communist Czechoslovakia and recently discovered the Catholic Church. On the way back to our hotel we drove along the beautiful Rhine River with all of the vineyards and mountains and castles. We also had our farewell dinner tonight with lots of comments and laughter and fun. 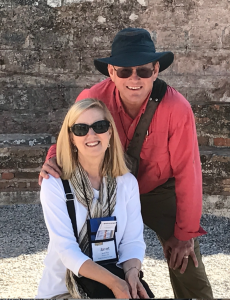 After eight days of intense touring of Germany and following all the sites of Martin Luther and the “Protestant Devolution” we finally said our goodbyes, shared our comments about the trip and headed home. But the trip was not only about Martin Luther and the Protestant rebellion. We also explored and toured the life of Saint Elizabeth of Hungary, understood World War II, the Nazi and Soviet Communist eras, the divided Berlin and the suffering of the people behind the Iron Curtain. The trip was also kind of like EWTN’s show The Journey Home with lots of conversion and vocation stories along the way including our local guide Klara who was an atheist in Czechoslovakia and has recently become a Catholic. But it was also a beautiful tour of Germany which is full of history, rustic castles, idyllic rivers and villages, old churches and excellent food and drink. 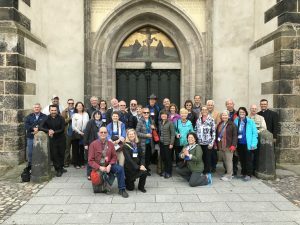 We learned a lot and even though I knew much about Martin Luther and the whole Protestant situation I think I doubled my knowledge by visiting all the sites and sharing the information among the group and especially with Ken Hensley’s excellent teaching. For those who want to learn more about Martin Luther, John Calvin and the whole Protestant revolt visit www.kennethhensley.com. More than half of the people on this trip it traveled with us before and again we bonded into a very close group of friends. There was no wrangling or discontentment among the group at all. It was smooth and harmonious and full of personal and spiritual growth and development. Everyone’s faith was deepened in the conviction that the Catholic Church contains the fullness of the truth and is, in fact, the church that Jesus founded 2000 years ago and that Martin Luther introduced a great rupture into that unity which has brought chaos into the modern Western world. We especially enjoyed celebrating Mass with these holy priests in cities that have become radically Lutheran. We again proclaimed the truth of the Catholic faith in the cities that have been deprived in many ways through their protest and separation from the unity of the one, holy, Catholic and apostolic church. I think we were the only Catholic group to take a trip like this on the 500 anniversary of the “Protestant Reformation”. I’m certainly glad that we planned and executed this trip and it was a marvelous experience for all of us. We expect to do this trip again in about five years. Enjoy the full 96 minute pilgrimage video below. 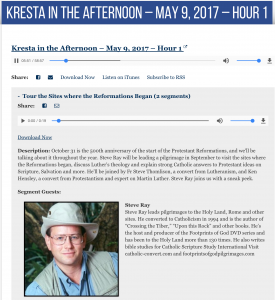 Steve and Janet Ray, in conjunction with Lutheran scholar Ken Hensley of Coming Home Network and Fr. 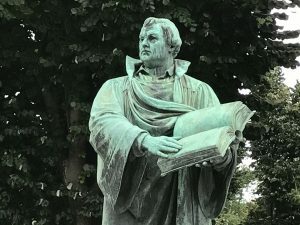 Steven Thomlison from Lincoln NE (convert from Lutheranism), led a tour through Germany – following Martin Luther and his schism with the Catholic Church. We visited all the primary locations of the Reformation: Luther’s hometown, Wittenburg where he nailed his 95 Thesis, the tower where he translated his copy of the Bible, Marburg to the castle where the Reformers argued and left in disaccord. Not only did we study Luther and the problems of the Reformation, but we also enjoyed the beauty and culture of Germany. Great food and wine (and German beer! ), a river dinner cruise, famous ancient biblical archaeology in Berlin Museum, touring the famous sites such as Brandenburg Gate, Checkpoint Charlie and much more. Catholics should be prepared to understand Martin Luther and the schism that he started. This was more than just a tour, it was also a seminar on the differences and similarities with our Protestant brothers and sisters. With a view to dialog and understanding, this seminar tour helped us work with ecumenical zeal to heal the wounds and separations in the Church. This was a fun and informative interview as an introduction to this 500th Anniversary of the Luther’s actions which started the Protestant Reformation (or Deformation, depending on how you look at it).